The FTD® Heartfelt Sympathies™ Gourmet Basket will warm and sustain them in times of sorrow. 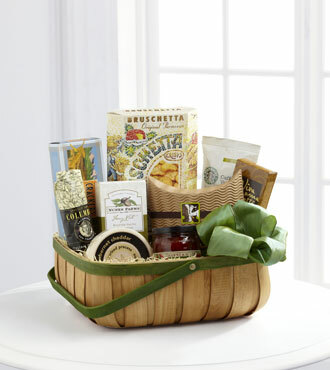 Accented with a green taffeta ribbon, this woodchip basket has a green trim and handle and comes packed with mouthwatering gourmet treats like biscotti, pistachios, red pepper relish, cheese and coffee. Grieving friends and family will appreciate this comforting gourmet basket which includes your free personalized gift message.